The Institute for Christian Muslim understanding began many years ago in Portland, Oregon, when two acquaintances, a Muslim and a Christian, decided to meet for lunch. One lunch became a weekly occurrence as each of them invited friends to join them. This handful of men and women learned firsthand the power of conversation to reveal common values between people of good heart. As word got out about their ongoing friendships, requests came for Muslims to speak at Christian churches and Christians to speak at area mosques. 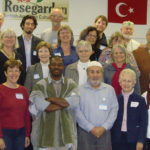 The growing group incorporated as a non-profit organization fifteen years ago and has since sponsor guest speakers, panel discussions, film screenings, workshops, concerts, and dinner discussions of A Common Word Between Us and You,* a joint letter written and signed by Christian and Muslim leaders around the world. All of theses events are designed as opportunities for people of good heart to meet each other, share a meal and discover a measure of common ground. Founded in 2003, the Institute for Christian-Muslim Understanding (ICMU) seeks to encourage appreciation of and respect for Muslim and Christian religious traditions on their own terms without polemics and proselytism. The Institute seeks to promote mutual understanding and open, nurturing relationships between these two religious communities. The Institute is committed to truth, justice, and peace at local, national and international levels. Through community, academic and intercultural initiatives, ICMU seeks to focus on both the dimensions of these faiths and the challenges of living them. In order to accomplish the mission, ICMU will foster both educational and cultural interaction; such interaction would help eliminate negative stereotypes and prejudices that may be in existence in both communities.